Well we started Joy School this week. We are really excited. We are in a Great group of 5 kids with parents who are all very involved and just as excited for the year like we are. Everyone is also very understanding of Isabelle’s allergies and are ready and willing to work with us. I woke Isabelle up and she ran into my room screaming, “Joy School, Joy School, Today is Joy School!” She was sooooo excited! 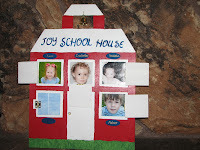 For those of you who don’t know, Joy School is an in home preschool program that focuses on values and preserving different childhood characteristics. We each take turns hosting and teaching the kids so I have 4 weeks off and then one week where I am responsible for everything. 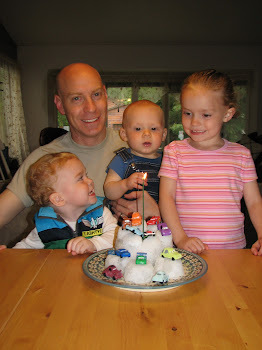 I like the thought of a program teaching children and parents how to enjoy childhood and life. They grow up so quickly. 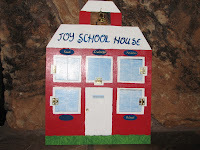 This is the Joy School House a made for the group. My craft for the month. 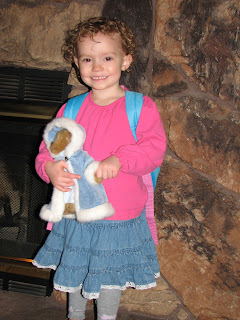 Yea Isabelle you started school, Aunt Alyssa is so excited for you...you will have alot of fun learning and making new friends! Love you Lots! You are such a great mom!!!! She looks so cute with her back pack and curly hair!! Oh Kaelynn, your family is so beautiful! Congrats to your little girl!